One of Earth's greatest rivers, the Mekong travels more than 4,500 kilometers from the Tibetan high plateau to the South China Sea. The river fans out into hundreds of waterways in Southern Vietnam. The dry season land was formed from sediment carried by the river; even today, new islands are created or peninsulas are enlarged. During the wet season, much of the delta's land floods. For centuries, the riverways have been the roads, boats are cars, homes float or are built on stilts; life centers around the river. Agriculture is the delta's number one employer. The area is nicknamed "the rice basket or Vietnam" and deservingly so, as enough rice is produced to feed Vietnam with a surplus to sell. The delta was once a part of the great Khmer empire. During the 18th century, present day Vietnam took over the land. Since then, it has caused tension between Cambodia and Vietnam. The Khmer Rouge, who wished to restore the glorious Khmer empire by creating an agrarian society, saw the delta as important land to reclaim. During their reign, the Khmer Rouge raided delta villages and massacred Vietnamese people living in the border area of the delta. The Vietnamese government finally could not tolerate the Khmer Rouge's policy and they invaded and overthrew the Khmer Rouge in Cambodia. Today, nearly every hectare of the delta is farmed or lived on by Khmer, Vietnamese, Chinese, and Cham people. Some families have ben there for centuries; other fled the Khmer Rouge genocide to find a new home. The freshwater and lush land provides everybody with hope. Most people tend to join a tour from Ho Chi Minh City to see the delta. The tours take tourists to the major locations using all the necessary forms of transportation: boats, ferries, buses, etc. This can be difficult to arrange on your own. Having had so much fun off the beaten tourist trail earlier, we decided we'd do our own tour. We kept it simple, planning only to visit Can Tho, the largest city in the delta, and Chau Doc, a border town with Cambodia. Both cities were typically included in some of the delta tour packages. An early morning start meant getting transportation to the local bus station ten kilometers away from Ho Chi Minh City's backpackerville. We were hauling all our stuff but we felt cheap motortaxis could still do the job. Before we got to the motortaxi hangout, we got stopped by a taxi driver. He wouldn't accept our $5 price; we wouldn't accept his $6 price. We continued on to the motortaxi hangout until he ran back shouting "OK. OK. Five dollars." Great, a taxi ride to the bus station! Despite the prearranged price, the taxi meter was running. This was the first time I'd seen a functioning taxi meter in months; why is it on when I want it off and off when I want it on? "Where you go?" asked the driver. "Yeah, Yeah, where you go on bus?" I really didn't want to answer the question because he didn't need to know but then Laura said, "Can Tho." "Ah, Can Tho. I take you bus go Can Tho." "No, no. Go to Mien Tay bus station." I was worried we were going to get stuck in some expensive tourist bus; I wanted the local bus. "Mai Linh go Can Tho. OK. OK."
At this point, the foreign language affect took over my mind. I misunderstood Mai Linh for Mien Tay. "OK. Go to Can Tho." Proud to come to this agreement, our driver held his head high and smiled into the rearview mirror. Two kilometers later, our driver pulled to the curbside of a business surrounded by green minivans. Three to four men ran to our taxi where both Laura's and my door were opened. "Where you go? Where you go?" We stayed put in our taxi where I made eye contact with our driver via the rearview mirror. Between the "Where you go?" shouts of our doormen, I called out "No. No. We got Mien Tay bus station. This is not Mien Tay. NO!" The taxi driver called of the doormen and he explained their buses go to Can Tho. I replied that we just wanted to go to the bus station, not Can Tho. We were off again; the meter was still ticking. We weaved through a major highway of Saigon where two kilometers later a passenger bus pulled from the curb in front of us. Once again, the driver made eye contact with me via the rearview mirror. "Bus go Mien Tay. Look. Look." I followed his pointing finger to the rear window of the bus where the word "Mien Tay Ben Xe" were stamped... Mien Tay bus station. "Yes, we go Mien Tay." "You go this bus, cheap. 4,000 dong/person. Me, already 40,000 dong. Better for you. You go this bus?" Laura shook her head in disagreement but I was convinced. "Yes, ok, we go bus." The driver blew ahead of the bus and once it pulled over, he pulled right in front of it. Both the driver and I jumped out knowing we hd to get the bags out, settle payment, etc. before the bus left. By the time we had the bags out, the bus was already leaving the stop. The taxi driver waved him to stop but the bus driver just shook his head no and continued on. Now what? "It OK. It OK. Another bus come in 5 minute. No worry." Laura gave me a disgusted look, as if to say "What the hell are you doing?" Somehow, this didn't deter me from paying off the taxi driver and seeing him drive off. Once again, we had no idea where we were and no idea how to get where we wanted... just what we were looking for. Turns out, the taxi driver was correct. Another bus came shortly thereafter; the cost was a measly 3,000 dong/person. An english-speaking passenger confirmed the bus did indeed go to Mien Tay bus station; we could follow him off the bus as it was his destination also. At the station, we got a local bus for 52,000 dong/person to Can Tho. It was a large minivan and somehow, we got preferential treatment. Despite being some of the final people to board the minivan, they gave Laura and I the front seat. This was spectacular, as the back of the van had at least one person too many in each row. The ride through the delta was smooth and uneventful. Our driver drove calmly for Vietnamese standards. At one of the reststops along the way, we recognized tens of half-packed green minivans all labeled "Can Tho, 67,000 dong". Turns out our taxi driver really was trying to help; Mai Linh was a high quality bus service to and from Can Tho, just a tad more expensive than the bus we were on. Upon arrival to Can Tho, we hauled our heavy backpacks two kilometers to a guesthouse that had been recommended by other travelers. The address was along a small, vendor-filled alley and after passing the guesthouse once, we backtracked to the proper address. Just as Laura entered the open-air lobby, a motorbike pulled in front of her. "You looking for room?" "Yes. Do you have one available?" "Let me see. Follow me." We followed the man to the front desk where he asked reception for a key and showed Laura a nice, clean room. This answer surprised us; our traveler friends had told us the rooms were $6. Not willing to haul our backpacks further, we agreed to the price and settled in. Before we started out to visit town, the man asked if we wanted tour information. We joined him at the lobby table to discuss the local floating markets and fruit orchards. His small boat hire price was 50,000 dong/hour. The tour options included a small boat through city canals to the Cai Rang floating market, exactly what we wanted to do. The price was right as the proposed price in the Lonely Planet guidebook was the same. I was close to signing up when Laura said, "OK. We'll think about it. Let's get something to eat first." We left the guesthouse where the following conversation ensued. "I don't like that guy. He's trying to pull a fast one on us." "Well, he's a tout for sure. He doesn't work for the hotel at all." "He pulled up with his motorbike because he saw us just entering the guesthouse with our big packs. He got the key from reception and showed us around. I bet the $8 pricetag is to pay his commission. If we had been alone, they would charge us $6 a night. If we had been one minute faster, we'd be saving $2/night. We are so stupid... why do we keep getting involved with these touts?" "Wow, I think you're right. I didn't even see that." We decided at that moment we'd only stay one night in Can Tho and we definitely wouldn't pay that tout another cent; his tour was NOT an option. Throughout lunch, Laura and I were furious about getting touted again. When would we learn? The only revenge was to avoid his tour but at what cost? Would we find anything else cheaper? We decided to visit the waterfront in hopes of dealing with a local boatman. The waterfront stroll was promising as we started our walk next to the large HCMC tourist tour boats that visit the floating market. We were offered boatrides in them, but they weren't what we were looking for. Finally, we were greeted with a shouting "Hello!" from a small, longtail boat docked along the waterfront. Once we stopped, a short lady with a cone hat ran up a steep paved ramp to the walkway above. Smiling, she said, "Boatride?" "Yes. Cai Rang floating market. How much?" 150,000 dong/hour was three times the price quoted by the guesthouse tout. My eyebrows raised and eyes popped out. "150,000 dong/hour. Very expensive." "OK. OK." She shook her head looking down at the ground trying to think of something. Frustrated, she pulled out her stack of dong bills and showed me 100,000 dong. I realized this woman didn't speak much English. We tried to discuss details but we couldn't come to understand each other. That's when I opened to a blank page in my Lonely Planet guidebook and began to draw. I wish I could scan the picture to put it here. I drew a boat going from Can Tho to the Cai Rang floating market and back. I wrote 1 hour to go, 1 hour to visit, and 1 hour to return, 3 hours total. I asked "How much?" She showed me her 100,000 dong note. We madethe deal for 6 AM the following morning and saved ourselves 50,000 dong, more than $3 to make up for the $2 the tout got from us. Wouldn't it be great for Lonely Planet to publish a collection of guidebook blank page drawings with the stories behind them? The following morning, our independent entrepreneurial boatwoman was just where she said she'd be and we were off to visit the canals of Can Tho. and cargo boats unloaded bricks or sand. Locals bathed or washed their clothes in the waterway. 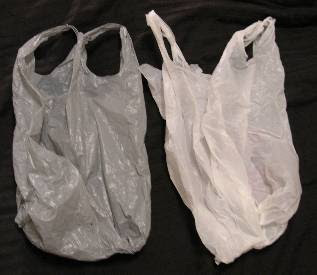 The only item that ruined the Venetian atmosphere was plastic bags. They were piled along the canal banks, floating atop the water, and jammed our engine rotor three times, requiring me to remove them with a jackknife. After an hour cruising through the river canals, we arrived at Cai Rang floating market. Business was bustling as floating market bulk vendors sold to smaller land market vendors. Salesmen advertised their product by tying them high on a stick. The market had boats of all sizes, from the one-stop-shopping Sams Club variety that sold carrots, cabbage, tomato, garlic, onions, etc. to boats our size that sold coffee, coca-cola products, or sandwiches. Laura bartered first for three BBQ sauce and pate sandwiches. I couldn't resist the draw of delta fruit and purchased fresh pineapples and pomelos at about half the HCMC prices. It was a fun hour watching deal after deal go down. Our return trip showed us the developing infrastructure surrounding Can Tho. Business is booming in and around the city and new bridges are linking the city to cheaper ground transportation routes. We passed by a number of large tour boat groups traveling to the market; we were proud of our choice not to join a tour as the larger boats cannot pass through the river canals of earlier in the day. We returned to the Can Tho riverside where we thanked our local tour guide for her service. We payd her the agreed fee and also gave her a pineapple and pomelo from the market. She dropped us off close to the Uncle Ho statue, a tribute to their revolutionary leader. That afternoon, we caught a bus to Chau Doc, a town near the Cambodian border. There, we would catch a boat North to Phnom Penh, Cambodia. During our afternoon stay in Chau Doc, we spent time at the riverside park where locals were out for their daily exercise routines. We brought the pomelo along and were arguing about the best way to open it. As we discussed it amongst ourselves, a group of exercising locals stopped to watch how we would go about it. The one woman in the group couldn't stay put on the sideline and she soon joined us, grabbed our knife, and had drawn and quartered the pomelo in a matter of seconds. We couldn't thank her enough; a pomelo divorce had been averted. The fruit was wonderful. The boat ride to Phnom Penh from Chau Doc included a short tour through a floating village. Houses were raised on stilts, powerlines were lifted high above the water, and everyone had a boat in their driveway. We return to Phnom Penh, Cambodia. Laura will fly to Spain from Phnom Penh. I will return to HCMC, Vietnam for my flight to the U.S.
Now, a break from the travel blog to discuss a new form of market bargaining. In Phnom Penh, we've been doing most of our souvenir shopping at the Psar Tuol Tom Pong (aka, Russian Market). The market is covered by a massive tent, but the powerful 40 degree celsius heat of the city makes the market unbearable during midday. Add to the heat the constant bargaining and "Buy something." comments and it can make for a less than ideal shopping environment. One day, Laura felt so nauseus we had to leave. The following day, she was roughing it through another afternoon of souvenir shopping. We would take a break at local drink stands to rehydrate, cool down, and calm nerves from the constant bartering. Feeling rejuvenated after a Sprite, Laura led me to a stand where she wished to purchase a carved stone meditating Buddha. We examined multiple carvings and selected one to begin bargaining for. "No, no profit. $10 too little. $20." "$12 very little. Can only do $20." "$18. Final price. Just $3 more." Suddenly, Laura wobbled on her feet and nearly lost her balance. The woman continued to barter, "$18. OK for you?" Laura closed her eyes and didn't respond. The vendor was unsure what was going on. A nearby vendor recognized Laura's issue, brought her a squat stool, and began fanning her. Laura sat, whoozy, with her head in her hands while the woman continued to fan her. "Too hot for you here. Just sit and relax." the fanning woman said. While this occurred, the vendor about to make a sale turned her attention to me. Appearing afraid the sale may not go through, she said, "Sir, $15, ok. $15, ok." I didn't confirm or deny the sale; I just pointed at my recovering wife. After a few minutes, Laura recovered and finished the deal, a carved stone meditating Buddha for $15. The question remains, was the fainting staged to get her price or was it indeed real? Only one person can resolve the mystery.